As Jews celebrate Purim this week it may be significant to consider the recent reappearance of many, if not all, of the Temple vessels that played a subtle yet significant role in the Purim story. Although the story of Purim takes place entirely in Persia and was not connected to any Temple rituals, the holiday is connected to the Temple and geulah (redemption) in several less obvious points. According to Jewish tradition, Persian King Ahasuerus served the feast described in the beginning of the Book of Esther on the sacred vessels of the Jewish Temple. When King Ahasuerus considered the Temple vessels for use at his drunken feast, first on the list would have been the gold and silver decanters used for libations on the altar. Last Sukkoth, a new gold vessel was used for the first time in a reenactment of the water libation ceremony. In a full-dress ceremony, Kohanim (Jewish men descended from Aaron the Priest) led the procession from the Temple Mount to the Shiloah spring. Amidst celebrations, they brought the container of water to a replica altar where the ceremony was carried out. Though not mentioned explicitly, it is conceivable, perhaps even probable, that the drunken king would call for the musical instruments seized from the Jewish Temple. Music was a central feature of the Temple service. As such, the Temple Institute prepared several types of silver horns for use in the Third Temple. In addition to the silver horns, rams' horns, known as shofarot, were also used. Perhaps viewed as the ancient version of the electric guitar, the harp was a staple of Temple music. Jewish tradition states that the Temple had an astounding 4,000 harps. The Harraris, American hippies transplanted in the Holy Land, were tasked by the Temple Institute over 30 years ago with recreating the Temple harp. Of course, a drunken Persian feast would call for sweet smells and the plunder from the Temple most certainly included a substantial quantity of the very special incense that was an essential element in the Temple service. In an astounding tale, a group of Noahides discovered an ancient cache of 600 kilograms of original Temple incense more than 25 years ago. Perhaps even more astonishing is that this Temple treasure has gone unnoticed by mainstream media and archaeologists, stored away at an undisclosed location waiting until it is needed. The true fate of the golden menorah from the Second Temple is unknown; a relief on the Arch of Titus in Rome depicts it being carried away after the Temple's destruction. The Temple Institute prepared a full-sized replica that is currently on display near the Cardo in Jerusalem's Old City. Covered in gold, the menorah is acceptable for use in the Temple and is intended to stand in the Third-Temple. Whenever the Temple vessels are mentioned, the Copper Scroll necessarily comes to the forefront. Discovered in 1952, the Copper Scroll is simply a list of gold and silver items from the Temple and the 64 locations where they can be found. Jim Barfield, a retired arson investigator and Noahide from Oklahoma, argues that he has the key to finding the precise locations of the Temple treasure. The only thing preventing him from retrieving the Temple trove is lack of permission from the Israeli Antiquities Authority. But as soon as he does, Israel will have a collection of Temple vessels that would put King Ahasuerus to shame. With so many of the Temple vessels either recreated or rediscovered, it is clear that the actual reinstatement of the Temple service is at hand. It is interesting to note that the creation of the vessels before the construction of the structure is precisely the opposite of the process of building the Tabernacle. Rabbinic tradition tells of a dispute between Betsalel, the artisan who built the Tabernacle, and Moses. The Israelite leader and prophet commanded Betsalel to fashion the utensils first and then to construct the Tabernacle. Betsalel demurred, suggesting that the house is built first and then filled with furnishings. Ultimately, Betsalel's concept was the guiding principle that led to the construction of the Tabernacle. Indeed, the plans to create the Third Temple in Jerusalem are well-advanced. In addition to the vessels listed above, calves are being raised in order to reinstate the ritual of the Red Heifer necessary for purifying the Jews. An altar is prepared that can be lifted onto a flatbed truck and delivered to the Temple Mount at a moment's notice. A registry of Kohanim lists candidates to lead the service in the Temple and bakers unraveled the mystery of the showbread, the unique bread with an enigmatic shape that stood inside the Temple. Oil for the menorah and for the grain sacrifices is prepared every year in the painstaking manner mandated by Jewish law to ensure purity. 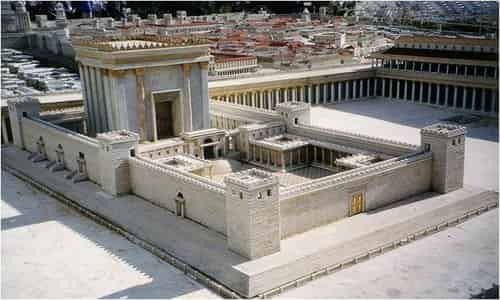 In fact, Rabbi Yisrael Ariel, founder of the Temple Institute told Breaking Israel News that if the Jews today were given the opportunity to jumpstart the Temple service, it would require a mere four hours to do so. Learn more about the Copper Scroll Project and it's potential impact on finding temple treasures and a rebuilt temple by clicking here.